Open space with the living room, with table & chairs, fridge/freezer, gas stove, gas oven, dishwasher, coffee machine, kettle, ventilation system big windows leading to terrace. With matrimonial king size bed ( 200x200), bedside tables, bookshelves, closet, TV, DVD player, table and chair, A/C, window on Trastevere's roofs. With bunk beds (170x80), Library,desk, drawers, closet, DVD player, table and chair, A/C, window on Trastevere's roofs. Set on 2 levels, with wood floor, table and chairs. Independent heating, A/C, HiFi, DSL Internet connection WiFi, DVD player, dw, wm, Hammam, Pianoforte, TV, Terrace. Penthouse in an historical building late '700, in the heart of Trastevere, 100 meters far from Santa Maria in Trastevere but in a quiet and silent street. The apartment has been renovated with green building materials and methods on March 2015. It is a penthouse full of light, with terrace and an additional roof garden with a view of the Roman domes. Each room is equipped with air conditioning and heaters. Energy Class A. The bedrooms are equipped with latex mattresses or futon tatami bed. It has a slate bathroom with a double bath tub including shower and Turkish bath. The professional kitchen is equipped with gas cookers, ovens and griddles. The lounge is equipped with an upright piano, a flatscreen TV with integrated DVD player, digital cable TV and stereo. Free Wi-Fi. The appartment is situated in a very interesting neighbourhood in the centre of Rome. Everything is close by. Beautiful location. The appartment itself is equiped with a nice terrace with a view and has very friendly owners who are very helpful and easy to reach. The season (july) was a bit too hot and the 4th floor is very warm. The airco could not work against the sun... For a couple with children it is a good place, but we came as colleagues and then the second bedroom was not so suited (more a childrens room). The house is friendly and welcoming but maybe also a little bit 'bohemien'... the bathroon can use an update. The apartment has been renovated with green building materials and methods on March 2015. Now is perfect. Really nice location but the apartment is unfortunately in very bad shape. Beds are not comfortable, sofa is really dirty and can't be considered as bed. I had to buy many light bulb change batteries in remote control etc. It needs urgent fixing and it will be really nice. We had to buy an extra inflatable matress to sleep 5 despite a request to the landlord who refused to bring a decent matress. Apartment too expensive for confort standard. Trastevere really enjoyable. This place would be great with just a litte care. The location is excellent! Within reach of everything and surrounded by beautiful cobbled back streets with plenty of restaurants (la scala was my favourite, exquisite) and shops. The apartment itself is lovely. There were one or two details that needed attention but over all very very good! no umbrella for terrace, outside floor in very bad shape and 2 A/C not working.no light for cooking and in the bathroom the sink is obstructed. Appartement trÃ¨s agrÃ©able, un peu juste pour 5 personnes mais certainement idÃ©al pour 4. Une adresse sympathique Ã retenir dans un quartier trÃ¨s attachant. pros: location is great, terrace is nice to eat on, the main living/kitchen area is the core of the apt and very nice; cons: do not attempt to arrive by car and get to the apt, it's 4th floor on very steep and narrow staircases (very difficult to do with a baby stroller), terrace is close to two large exhaust pipes from restaurants below. Overall, we had a good time, thank you. 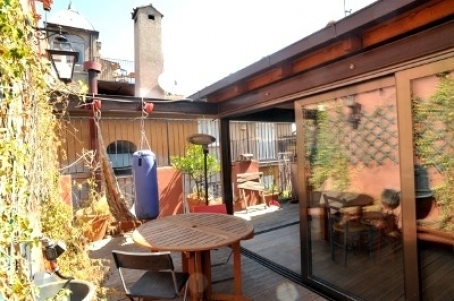 Very nice and comfortable apartment situated in the heart of Trastevere â€“ yet quiet ! Lovely spacious terrace with a little second terrace (although you will have to work your way to it as path is rather steep) overlooking Romeâ€™s roofs with St-Peterâ€™s dome in the distance. Nice bathroom: rather small but renovated, functional and plumbery in excellent conditions, very good shower cabinet. Very nice experience, I will certainly rent in again the future. trÃ©s bel appartement trÃ©s bien situÃ© Ã trastevere a quelques pas du centre historique.Pour l'accÃ©s adsl il faut sans doute venir avec sa box! le canapÃ© du salon est un canapÃ© sur lequel on peut dormir mais pas un canapÃ© lit. A part Ã§a c'est vraiment un appartement magnifique.